Well, Indian reality game show Big Boss has never failed to provide us with contestants with pretty impressive and interesting backgrounds. And this time too it has come up with some unique contestants who have quite shocking facts to reveal. And one of them is Swami Omji Maharaj. Well, we are not sure whether he is going to like some of these revelations or not, but this article is going to offer you with some pretty surprising facts about Swami Omji Maharaj. Now, to speak frankly about Swami Omji Maharaj, he is one of the rarest individuals you are going to meet in Big Boss. According to claims made by Maharaj, he hails from an independent political party who contested in the Delhi Assembly elections of 2015. He was a contestant from Palika Bazar. He is a member of the BJP of India and he claims that PM Modi has asked for his assistance during the 2015 elections. Well, this self proclaimed Swami seems to be a person of really aggressive nature. His independent party is Akhil Bharatiya Hindu Mahasabha. Till date he is 59 years old and the son of Vidya Chanda. Now that we have covered the family history and bio data of this self proclaimed Swami, let us dig deep into some of his controversies. We bet you are going to be interested. One of the major controversies that he got involved in is his intention to kill Arvind Kejriwal. Yes, you heard that right. He is the follower of Asaram Bapu and Rampal. Now this clearly states that either he is a deaf person or tries to be one. These are the type of saints that no one has ever heard of, except a few times just because they did everything they could to get into the attention of the media. 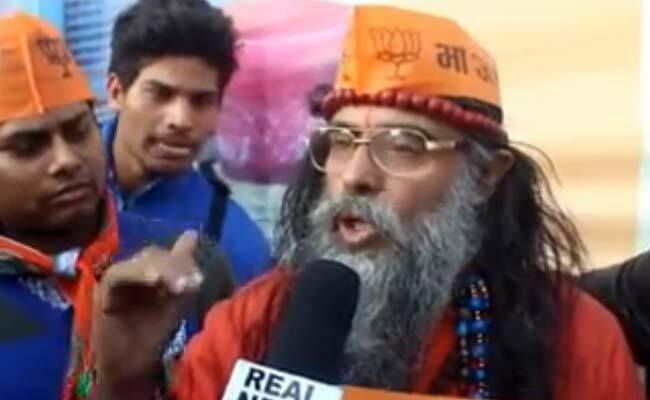 Swami Omji Maharaj claims that Arvind Kejriwal is actually a traitor and Mr. Kejriwal is not going to stay in power of Delhi for a very long time. The reason is he is going to kill Kejriwal. Well, if he can do that, then it is going to be good for India. But unfortunately we are not sure how he can do that. Now apart from that, he was also involved in a much more controversial comment. According to Swami Omji Maharaj, his party has killed Mahatma Gandhi of India. And he also states that Nathuram Godse was a member of the Hindu Mahasabha. Now that is something really we would love to have a debate with Mr. Swami Omji Maharaj. When asked how he can be so sure that Nathuram Godse was the member of Hindu Mahasabha, he could not provide a proper answer (as expected!). But one thing that he admitted is, he had committed a mistake of beating up Kejriwal once. And he also threatened that if Kejriwal does not listen to him, he is not going to spare his life. He has written a book, it is known as “Desh Drohi Kejriwal”. We are not sure about the content of the book, but seems like he has provided some really dirty secrets of Kejriwal in that book. One copy of that book was also sent to the Chief of Staff of the AAP political party. We bet he is going to be one hell of a contestant!